If you are standing anywhere in the North York Moors National Park you will never be more than 1 mile from a known archaeological site. Help care for this heritage. We are very excited that we’ve been successful in securing a grant of more than £170,000 to support a new project – Monuments for the Future. This will help secure the future of historic monuments in the North York Moors and increase public understanding of their significance. The funds have been awarded by Historic England, who supported the National Park’s previous Monument Management Scheme from 2009 to 2018. There are tens of thousands of monuments and other archaeological sites in the National Park. Currently 842 of these have been ‘scheduled’, this means they are nationally important and protected in law*. 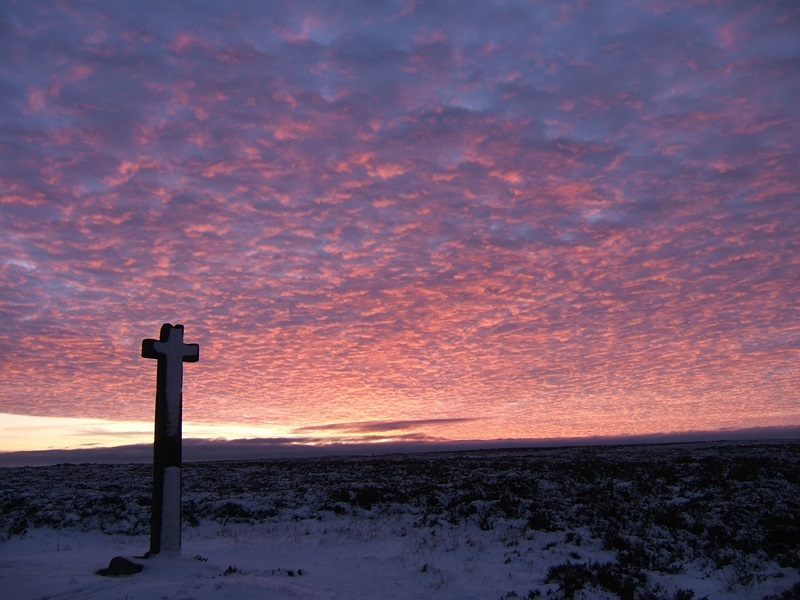 History and its monuments are embedded in the landscape of the North York Moors. Young Ralph Cross still stands upright by the road on Rosedale Head. The horizon is spotted with funerary round barrows (marked as tumuli or tumulus on maps), and crossed with ancient dykes thought to mark the boundaries of territories. Look closely and evidence of the lives of our hunter gatherer ancestors can be seen on rocks decorated with ‘cup and ring’ marks. Occasionally flint tools or arrowheads are still found on the moors (recorded as a ‘findspot’ on the HER map**). And of course there are the more recent remnants of history – castles, abbeys, trods, iron works . . . far too many types to mention but all worthy of our care and attention. Key to the new Monuments for the Future project is providing training and support for an increased numbers of volunteers. We want to encourage and build a sense of ownership for the monuments amongst local communities; engaging people, young and old, with the heritage they have on their doorstep. So we are looking for people to join our volunteer survey team to look after our Scheduled Monuments. Volunteers working in pairs or individually, with the kind permission of landowners, will visit archaeological monuments to check on their condition. Problems are commonly caused by bracken or erosion and the volunteer surveys are vital to identify issues in order to target practical management which can help sustain the monuments. To get the most from this voluntary role you’ll need an enthusiasm for archaeology/history, a reasonable level of fitness, and an ability to read a map or else an ability to team up with someone who can. Some sites are easy enough to find but some can be more difficult, volunteers can choose the level of challenge! Training days are planned for August and September this year. Please do get in touch if you are interested in being a volunteer or you just want to find out more – we would love to hear from you. * The National Heritage List for England (NHLE) is the only official, up to date, register of all nationally protected historic buildings and sites in England – listed buildings, scheduled monuments, protected wrecks, registered parks and gardens, and battlefields. ** This is a map of the North York Moors Historic Environment Record. It’s a handy way to check out our claim that ‘If you are standing anywhere in the North York Moors National Park you will never be more than 1 mile from an archaeological site’. Please let me know if you can catch me out! This entry was posted in Conservation, Historic Environment, Landscape, Local Community, National Park, North York Moors and tagged Archaeology, Historic England, History, Monument Management Scheme, Monuments for the Future, Scheduled Monument, Volunteers by North York Moors National Park. Bookmark the permalink.